Not everyone has the same idea of fun, but there is no question that certain things are agreed to be fun by everybody. Among these are fire, shiny things, and things that fly around. These three things come together in a tiny, shiny little rocket the size of a matchstick. 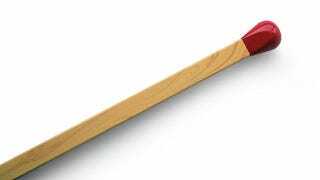 Making a matchstick rocket takes only a few minutes, at least some of which should be used in finding a large empty space, without any flammable objects. First take a roughly three-quarter-inch square piece of aluminum foil and wrap it around the head of a matchstick. Insert a pin between the foil and the stick and push it up towards the match head, creating a little tunnel. Next grab a paperclip and bend the outer segment out to make a triangular base. Pull the inner curve up so it is angled upwards like a ramp. Put a large segment of aluminum foil on the ground and set the paperclip launchpad on it. Carefully place the matchstick on the ramp. Grab another match, light it, and hold it under the aluminum foil covered head of the match-rocket. The rocket should zoom off and fly around. The chemicals on the head of the match are the fuel for this rocket. When they start to burn, they give off fast-moving gas. The gas escapes through the tunnel created by the pin, shooting backwards. The backward movement 'pushes off' on the foil and shoots the matchstick forward. And what you have is a shiny, flaming thing that flies around the room. That always has to be fun.